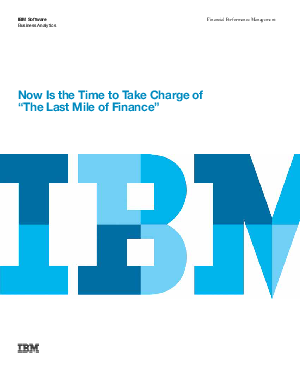 “The Last Mile of Finance” is a term popularized by Gartner and others to describe the finance processes and activities that occur between the financial close and financial reporting and disclosure. Increasing regulatory reporting and compliance requirements, along with recent advances in applications targeted at automating and enhancing these processes make now the most effective time for finance to focus on taking charge of The Last Mile of Finance. Today’s CFO is under a myriad of pressures to control costs, meet expanding reporting and compliance requirements, and support corporate growth initiatives (capital investment, foreign expansion, M&A etc.). To meet all of these requirements, CFOs should consider “The Last Mile of Finance” as a target for cost control, process optimization, and risk reduction that can enable finance to better support the strategic goals of the organization.